Amazing that a soft, cushiony material can pack such a punch against uneven, rough paint! Don’t let the gentle-sounding name fool you. Use this lambswool pad for attacking badly oxidized, uneven, rough painted surfaces. When used alone, it levels paint, prepping it for the next step. Be aware of the swirl marks it can create, especially at high speeds. I like the lamb’s wool pad best used as a cushion under a bonnet. The lambswool pad helps provide a gentler, more even pressure against the surface when you’re applying polish, wax, or buffing them away with the bonnet. 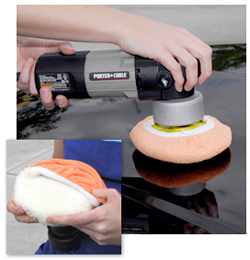 The lambswool underneath the bonnet helps foolproof your polisher, particularly if you’re a beginner with the machine. There is a difference in the buffer performance and the end result when the pad is added. the finish on the total surface is much better. I used them on car paint surfaces also to polish up wood vanished surfaces, works great. This is the perfect pair with a microfiber bonnet for removing wax. Gives you the leveling you need for even surface pressure.